The mission was established in 1907 and from the beginning had an intimate relationship with the local First Nation. 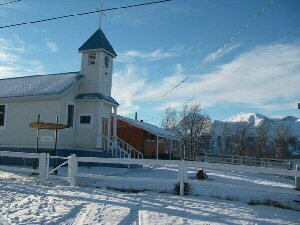 The church property was given to Fr J. Allard, OMI by Chief Taku Jack, Atlin Tlingit First Nation, now Taku River Tlingit First Nation. Shortly before the Alaska Highway construction started, In those days, the relationship between Whitehorse and Atlin was reversed! 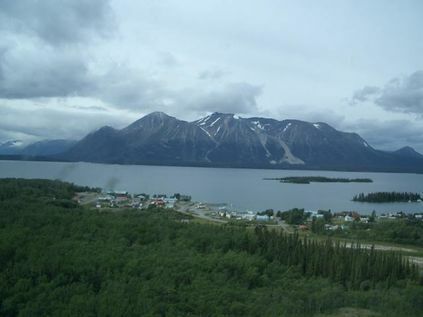 Whitehorse was actually a a mission of Atlin. This village had the first Native residential school in the Diocese. Fr. J. Allard, OMI was its builder and director. He had received some property from Chief Taku Jack for the project and for the construction of a church. The school was in an ordinary family dwelling and so was the living area for the students. Fr. Allard was assisted by his sister from Quebec for 2 years. The school was in operation approximately from 1924 – 1926. Fr. Allard was also the missionary for the local gold mining creeks. These mines and their miners were generous benefactors to Father’s mission and his work. After the gold dwindled in the creeks, Atlin lost some of its importance. As a result, Fr. Allard was stationed elsewhere and only served the town again later when more missionaries were available. In the late 1930’s Fr. Charles Hamel, OMI was the local missionary. He was missionary to Carcross and the small number of miners in the area. Later on Whitehorse was added to this list until 1942 when Whitehorse became the see of the diocese and Bishop Coudert became its resident pastor. Fr. Bernard Arsenault, OMI was pastor here and missionary to Carcross from 1947-48 when he left to the study to be a teacher at the University of Ottawa in 1948. Fr. Marcel Bobillier was pastor for a good number of years. He was well liked by the people. He was a man who loved to play bridge. One night in the heart of winter, he was next door at the neighbours playing bridge. Before the last game started he went home to light his wood stove to warm his house. He rushed back to play the game but before too long, the rectory had caught on fire and burned to the ground. A new rectory was built. Fr. Bob, as he was affectionately called, loved to travel to as many of the local creeks and regions as possible. In his diary, he kept an count of how many times he went into such places as Tulsequah, BC (a mining area around the Stikine River – only accessible by air – Fr Bob would hitch a ride when freight was ferried in from Atlin). The first actually ordained priest of the diocese, Fr. Emmett Engel served for awhile in Atlin until he was moved to Whitehorse. Fr. Joseph Plaine, OMI was the longest surviving pastor of this community. He was parish priest for 29 years and 11 months. It was during Fr. Plaine’s time that summer Mass at Bennett train station and Bennett Lake started. He enjoyed going to these places from Carcross on the train and eating with the personnel of the train and hotel. Fr. Joe was a weekly contributor in the local newspaper – the Atlin Claim. He did this for several years. While away on holidays in France, in the mid 1970’s, Bishop O’Connor and Provincial, Fr. Tanguay, decided to install running water and a bathroom in the rectory. A trench was dug from Atlin Lake to the rectory. Water lines were laid and the job was completed to the satisfaction of all concerned. When Fr. Joe arrived back he was somewhat taken back. He had to give up the use of the yoke that had been carved by Chief Taku Jack and which had been used by every missionary since to haul water from the lake, two buckets at a time. In 1992, Fr. Plaine retired as parish priest. He came to reside in Whitehorse at Sacred Heart Cathedral and to take on the ministry of visiting the shut-ins. Before anyone went to live in the Atlin rectory, a retro-fit was done to the building. Fred Musual was given the job of rewiring the house, insulating attack, and replacing outside doors and windows. Some areas were repainted and a new wood stove was installed Some of the parishioners helped in the project, especially the Trudeau family who generously donated lumber from their local sawmill. Bert and Cecilia Nagel were the new occupants of the rectory and had to fill Fr. Plaine’s shoes as pastoral assistants in this mission. The Nagels were the first volunteers who came to give their time and talents to Bishop Lobsinger. Before arriving in Atlin, they served in many different capacities at different places around the diocese. To them must go the credit of saving the life of Chief of the Atlin Tlingit Native Nation. In 1994, early March he was driving his snowmobile across the lake towards the mission. Cecilia was looking out of the rectory window watching the snowmobile come closer when suddenly it disappeared – driver and all. She quickly called her husband Bert who with ladder and rope went out to assist. For his bravery, Bert has received a citation from the RCMP. Bert and Cecilia have done many things to improve the church and rectory buildings, the inside and outside. It is a very pretty spot to visit. Of the property that was originally given to the church by Chief Taku Jack only about a quarter is still under church title. 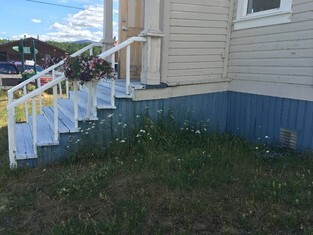 The first part was sold in 1962 by Bishop Coudert for a very small price to the Department of Indian Affairs when it was procuring land for a Native village within the Atlin village boundary. Bishop O’Connor gave a piece of land to the Band when a new band office was to be built in 1985. Bishop Lobsinger agreed to a request for land from the band for a cultural building in 1994. The Pastoral Administrator from 2000 – 2009 was Sr. Shirley Lehovish GSIC. The current Contact Person since 2014 is Mr. Laurie Boguski. RESOURCE: Official websites of local First Nation and the Town; “As Time Goes On” by H. Spruyt, OMI; Questionnaire Survey; Interview with active church members.